Submitted by lynn on Friday, July 24, 2015 - 1:26pm. 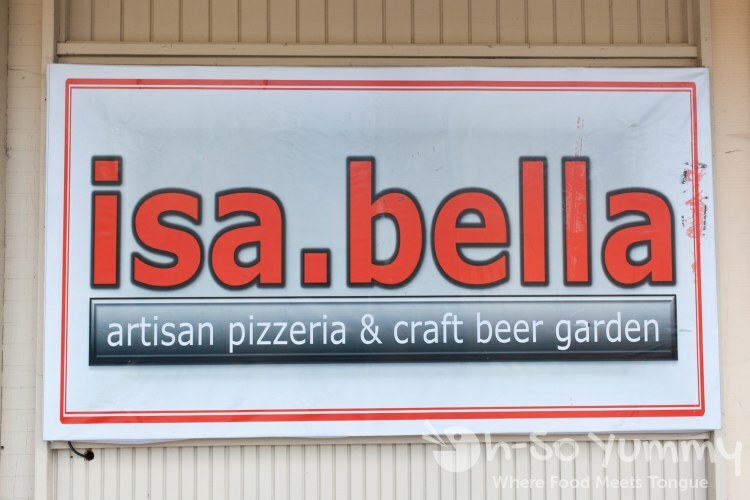 We were invited to check out Isabella Artisan Pizzeria & Craft Beer Garden. On our way there, we noticed that it was on the same road as the Costco on Moreno! The elevation of the restaurant combined with Costco tunnel vision (find parking, buy stuff, wait in lines, get the hell out) has kept us from noticing it before! But once you know about something, finding it becomes a lot easier! Their parking lot is shared with a few other businesses and was half full when we got there. After entering, the open bar area is the first area to greet you. To the left is the main seating area. It's very spacious inside with uncrowded seating. I'm also a fan of the red accents and lighting everywhere! 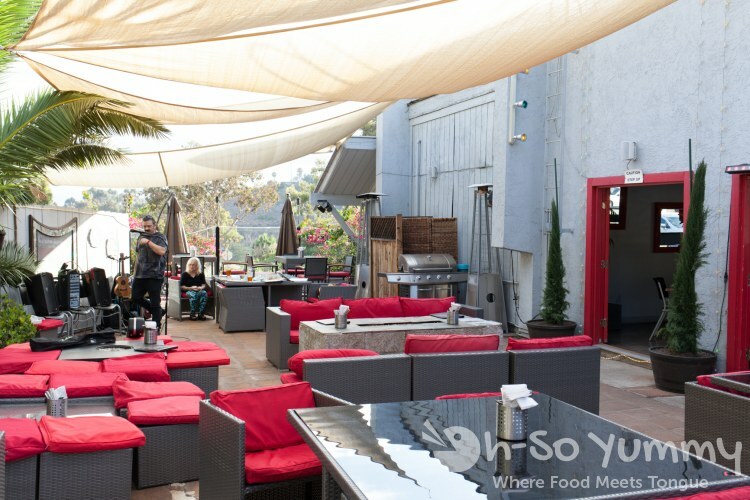 The cozy, well-lit patio was the perfect choice to enjoy the great San Diego weather though. It's also pet friendly; we saw a waiter filling a doggie bowl for another guest. 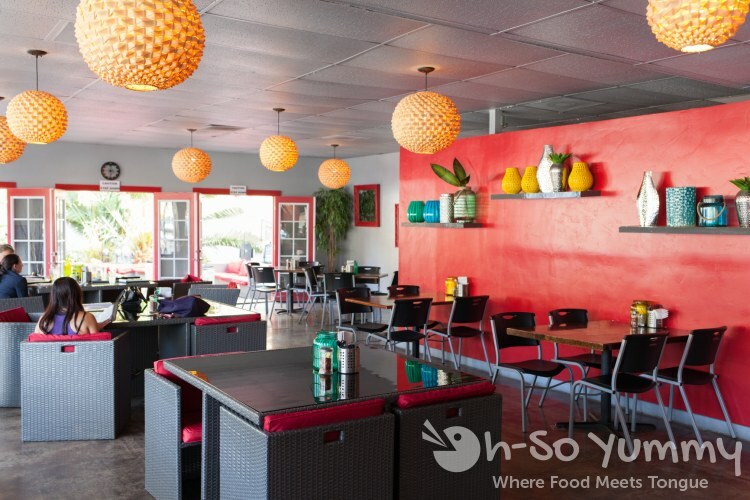 We chatted with the owner Gary to learn about the restaurant. He had sold his other company in 2010, bought a hot dog cart and created a Sausage Bomb Sandwich that he served to the late night crowd in PB. He then decided to go all in and open a full service restaurant 2 years ago. He's also the main cook so he has quite some involvement in the restaurant! Our waiter Brandt took great care of us as well. He was the most knowledgeable staff, having worked there since it opened! We decided to try the Garlic Wings which came with 6-7 decent sized chicken pieces. The meat was juicy and the cornmeal batter kept it crispy underneath the sauce. The flavor was different than what the name suggested, not so much garlic but more of a sweet and spicy asian glaze plus a tiny kick to it! There was a generous amount of additional sauce on the bottom and Dennis the dipper made use of it! Next came the Eggplant Marina! 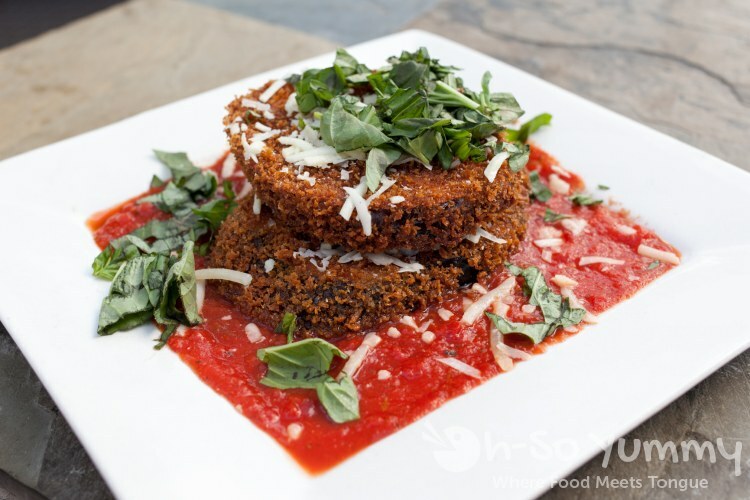 This appetizer was quite fried with larger sized breadcrumb crusts while the eggplant beneath was soft and not bitter! The basil strips and simple red marinara complimented the eggplant but my big dipper husband wanted more more more sauce! This one seems appropriate to share though because it is on the heavier side. Our two pizzas came out at the same time on individual pizza peels, personal size around 10-12 inches diameter. 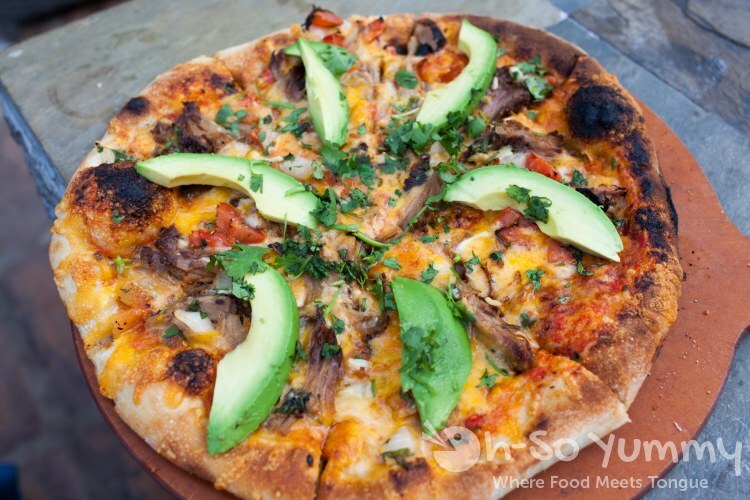 Isa's Carnitas Pizza has slow roasted pork scattered throughout plus cheddar-jack cheese, topped with avocado slices! In fact, the one thing missing may have been fresh homemade salsa to brighten it up. Notice how we're approaching it like a mexican dish! Because of its unique spin, Dennis coined this "the un-pizza" haha! 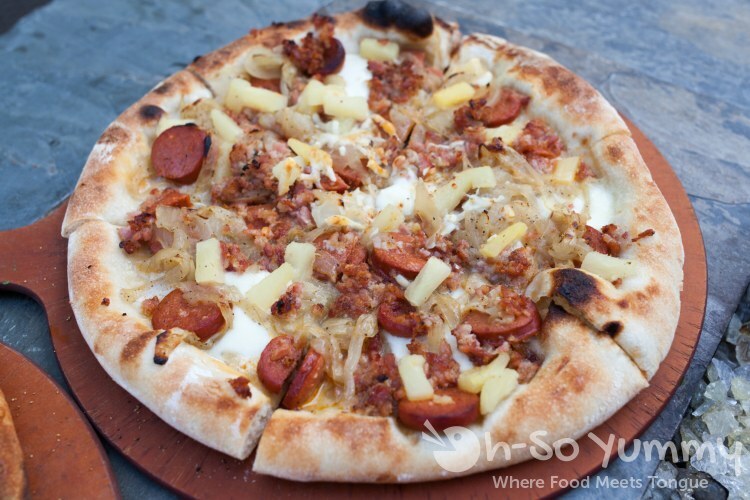 The Sausage Bomb Pizza is a variation of the original Sausage Bomb Sandwich. The first flavors that hit our tongues were the subtle sweetness of the onions and pineapple. Dennis isn't usually a fan of Hawaiian pizza but this one totally worked for him. The sweetness balanced out the savory meats, mainly the crumbled bacon and thick spicy sausage. I'd say this sausage wasn't spicy though. The outer thin crust was crispy, but got soaked in the middle due to the heaviness of the ingredients. A little folding and re-topping never hurt anyone! I enjoyed this pizza much more than the "un-pizza" and would have eaten it all if not for the fried appetizers! We had several choices for dessert but opted for house-made ones. This meant the lone brownie dessert was passed over. As soon as I heard about the night special Tiramisu, I ordered it. The lady of the house had spoken. We couldn't believe the size of this HUGE dessert, tall and just as wide as the eggplant appetizer earlier! Gary's take was to add more texture through the crunchy toppings. We agree it was a delicious addition! The espresso flavor was light and not bitter. The only nit-pick was that the very bottom of the cake had a wet spongy layer (like cake in water) but after removing it, the rest was decadant! We thought we were done but couldn't say no when Gary offered a churro to us. Instead of one, a whole platter came out! 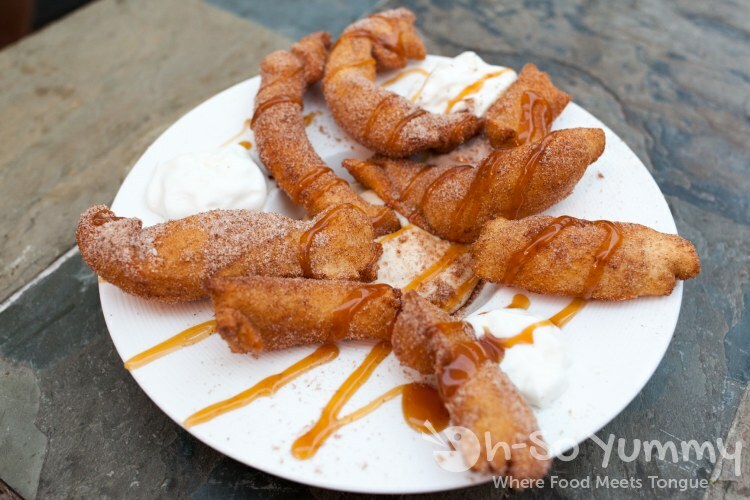 These were fatter than usual, more like pillowy doughnut churros! After a bite, we noticed it was salted! After mentioning this to the waitress, we found out that there was sea salt (in addition to the normal sugar) as a compliment the accompanying caramel cream cheese spread. Makes perfect sense now! Although, I found the skin to be on the thicker side. Tiramisu wins this battle of the desserts! There are other items that interested us (we didn't even get to try the pasta) but we only have two stomachs! 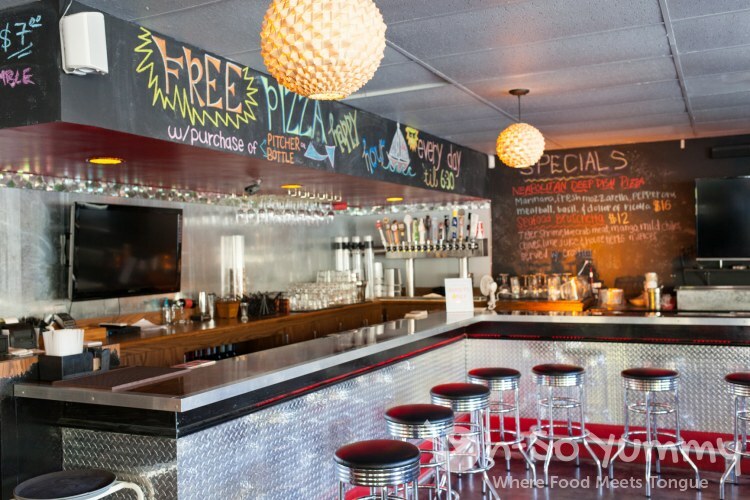 They also have a happy hour foods and a promo of buy a pitcher of beer or wine get a free cheese pizza. Additional toppings are extra of course. There was also live music that night. I didn't notice much at first but suddenly I heard a familiar tune... the Super Mario Bros theme song! 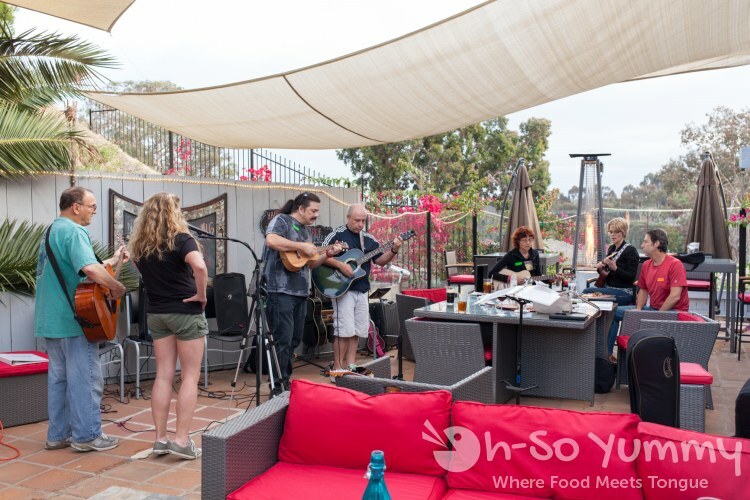 On a ukulele (third guy from left)! OMG! After he fiddled around some more, including Super Mario dungeon music too (OMG again! ), I clapped and practically called out encore. Can you believe his name WAS Mario and he and his buddy used to DRESS UP as Mario and Luigi!? Being fresh off Comiccom, I was totally feeling that vibe! Afterwards, it seemed like some other musicians and singers joined in for non-game music. It's a musical community though! I have to admit that my week was a little bit stressful beforehand, but this visit really picked up my spirits. Seriously, the live music was such a mood-pleaser for me! The food was pretty decent and the ambiance was calm and inviting. I'm looking forward to another visit! Disclaimer: we were hosted for the meal but the opinions are strictly our own. This sounds amazing! 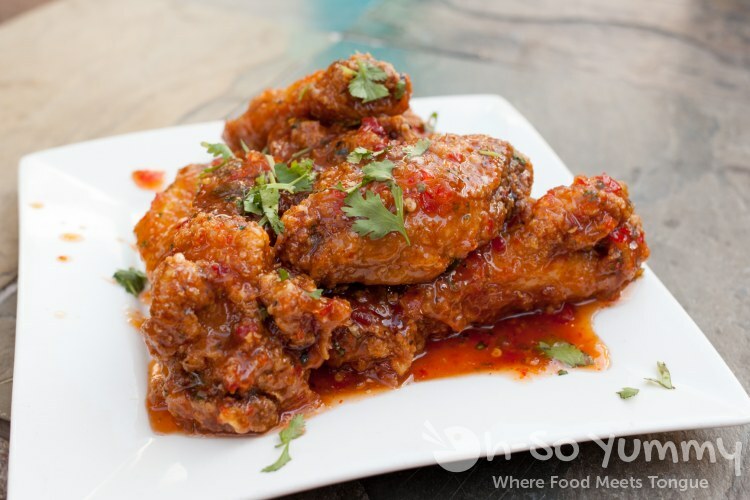 My wife LOVE wings and I love a funky take on a pizza, so I know we'll be checking this out soon. great! let me know your thoughts when you try it! I'll definitely have to come back for the Super Mario music if they have it again, haha! That "unpizza" with the avocado looks delicious. 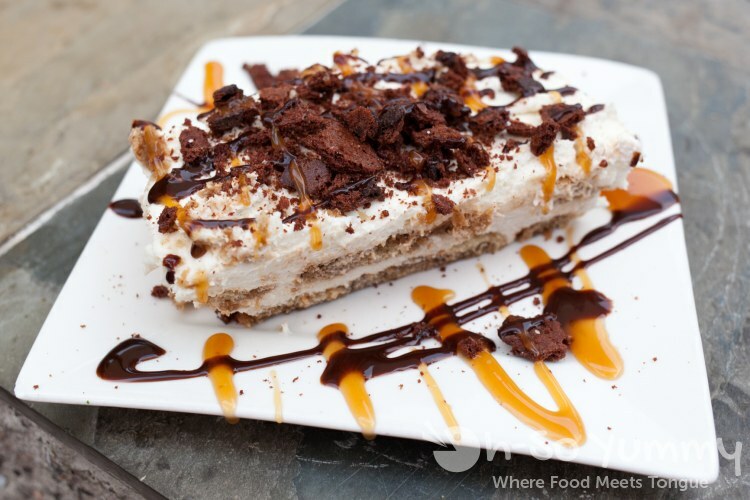 The tiramisu also looks so good! There's a bunch of other nerdy game music that I'd love for them to play as well hahah! Maya would love hanging out there too!